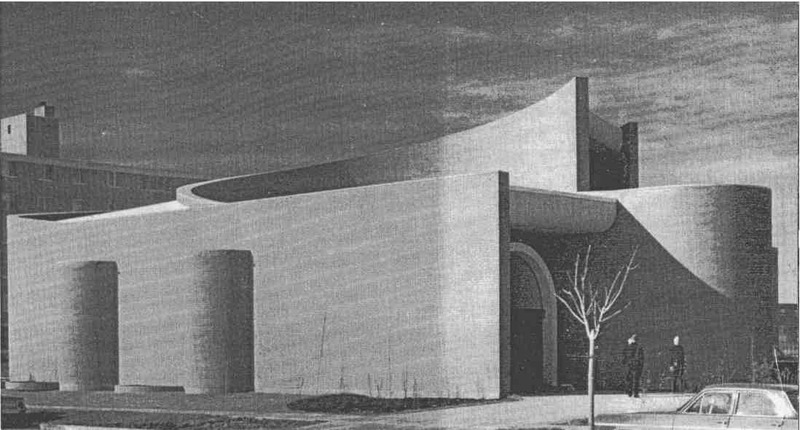 left: St. John Brebeuf Church, Winnipeg, Libling Michener & Associates, architects, 1966. Photo courtesy Canadian Architect Yearbook, 1966. The original reason for this post was to announce that the fine folks at the Winnipeg Architecture Foundation have made the full text of my 2005 book, Making a Place: A History of Landscape Architects and Landscape Architecture in Manitoba available as a pdf online at their website. (It was originally published by the Manitoba Association of Landscape Architects exclusively as a cd-rom.) See link below. But there is so much more on WAF site that is of interest for fans of Winnipeg architecture of the modern period, 1945-1975. There are biographies of important Winnipeg architects of that period, profile pages on buildings themselves—not just the usual suspects, but other more modest houses, commercial and public buildings. You can buy self-guiding tour brochures for Winnipeg Brutalist architecture; or the modernist buildings of both the University of Manitoba and the University of Winnipeg; or modernist Broadway. You can even show your love of Winnipeg mid-century modern by buying handsome buttons depicting, for example, Étienne Gaboury’s wonderful Precious Blood Roman Catholic Church. Like them on Facebook and consider making a donation. See their exhibit, “University of Manitoba Modern Architecture” in the main floor exhibit cases at the Millennium Library until July 31, 2014.